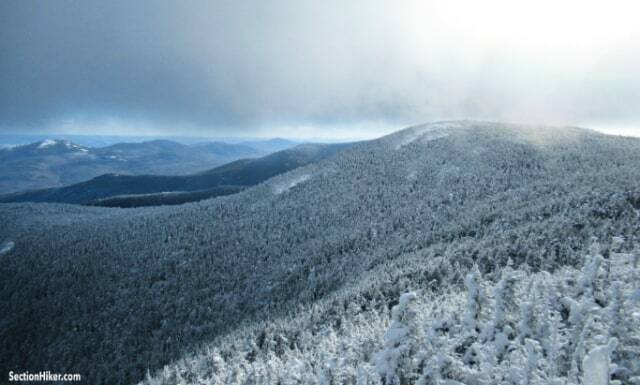 The Imp and North Carter Mountain are in Pinkham Notch across from Mt Washington and the Great Gulf. The Imp, or Imp Face as it’s also called, is a picturesque cliff and view-point overlooking the Presidential Range. North Carter is a 4000 footer, but not one listed on the AMC 4000 footer list. It has views of Mt Lethe (another 4000 footer not on the AMC list) and the Baldfaces in Evans Notch. The Imp Trail forms a loop, so you can hike up the north end and down the south end (the ends are separated by a short 0.3 mile walk along Rt 16, which just takes a few minutes to walk.) The North Carter Trail starts near the half way point of the Imp Trail and is a less travelled route up to the Carter Moriah Ridgeline and the Appalachian Trail which runs along it. Hiking the Imp and North Carter Trail is usually considered an intermediate group hike or snowshoe (8.7 miles w/3300′ of elevation gain), but the early winter conditions we’ve experienced this autumn, made it a much more difficult excursion. 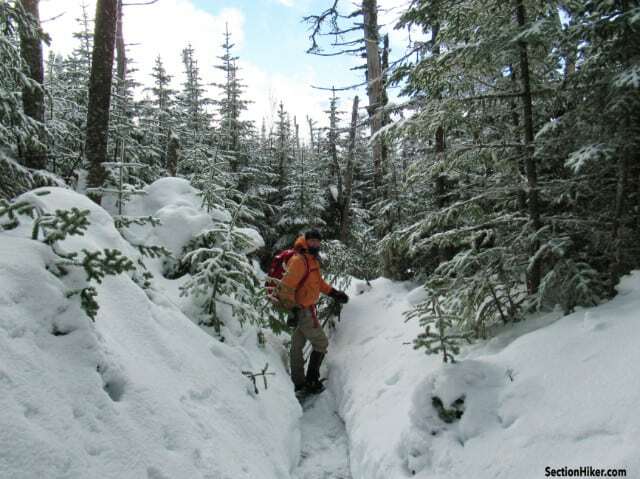 There is a lot of snow in the Whites already, about 2-3 months ahead of its normal schedule. I don’t think I’ve every seen this much snow in November and December in the 10 years I’ve been hiking in the Whites. Snowshoeing up to the Imp Face viewpoint wasn’t bad, since the trail had been lightly broken out by previous visitors. We were able to hike up to the cliff face in microspikes. Unfortunately the view was obscured by low cloud, but we could still see down the cliff to the ground below. From that point on, the Imp Trail gets wilder and narrower, with many small stream crossings as it slabs south towards the North Carter Trail junction. The trail corridor also gets significantly narrower, with spruce trees hemming in on both sides. As it snows, these spruce trees get covered with snow but voids remain below their branches. If you step on one of these voids, you’re likely to plunge down several feet into a hole, called a spruce trap. These can be quite exhausting to try to climb out of, with the soft snow along the edges of the hole collapsing below you as try to clamber out. This section of the Imp Trail also crosses many little streams which also create voids under the snow. We were all wearing insulated waterproof boots for this hike, but the risk of getting wet still remains if you plunge through a hidden snow bridge or the opposite snow bank collapses under your weight. We made it across all of the stream crossings fine, but we also had a decent sized group capable of providing mutual aid if the necessity arose. We all took a food and water break when we reached the North Carter Trail Junction before we headed up to the Carter Moriah Ridge. This section of the hike got tough fast when we hit a long section of bordering spruce. The snow had filled in between the trees and the trail was buried under 1-3 feet of snow. I hit a couple of pockets and had to climb out of them, which was exhausting work. There were also blowdowns across the trail that we had to skirt, duck under, or climb over. 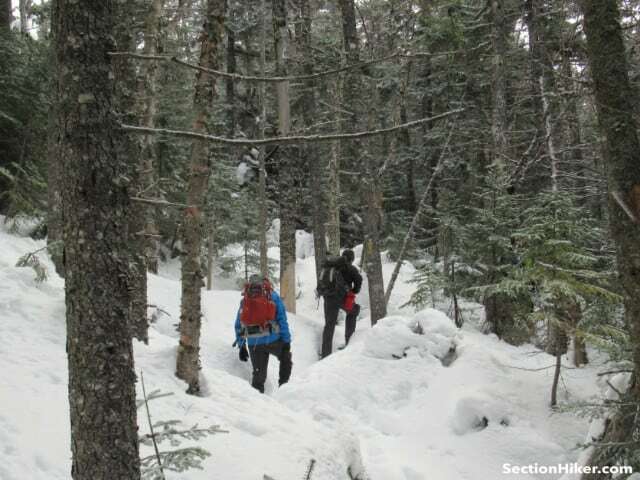 This section of the hike felt a lot more like a full-on winter bushwhack than a relaxing hike up a winter trail. But Alden, who took point on this section, stuck with it and made steady forward progress with the rest of us in tow. We eventually made it to the ridge and started hiking south to toward the summit of North Carter, looking for the white blazes that mark this section of the Appalachian Trail. We promptly lost them, either because they were buried, or because they were obscured by fallen trees. This section of the Carter Moriah Trail is notorious for blown down trees every winter because it’s the highpoint between the Gulf of Maine and Pinkham Notch. The group spread out to look for more white blazes, which concerned me because I was worried about someone falling into a spruce trap. The actual AT corridor is fairly safe from these because it has a maintained width, but if you step off into the surrounding krummholz, all bets are off. I got everyone back together and we soon found another blaze. Even then, the trail was hard to follow with more blow downs in the tread. We passed fine overlook, with an excellent view of neighboring Mt Lethe and the Baldfaces as we followed the contour to the summit, or where we thought the summit was on this relative flat peak. The temperature on top of the ridge was 5F (the valley below was 21F) and I know I was feeling chilled. So we beat feet back to the North Carter Trail and back down to the Imp Trail, before following the south branch back to our cars. The hike down and out was easier than the hike up, but it still took us a few hours to cover the distance. We actually made it back to our cars, just at sunset, around 4:20 PM, making this an 8 hour hike. Due to the snow depth and spruce traps we encountered, this hike turned out to be far more challenging than I expected. It’s hard to believe that it’s just the beginning of December now and calendar winter is still a few weeks away. 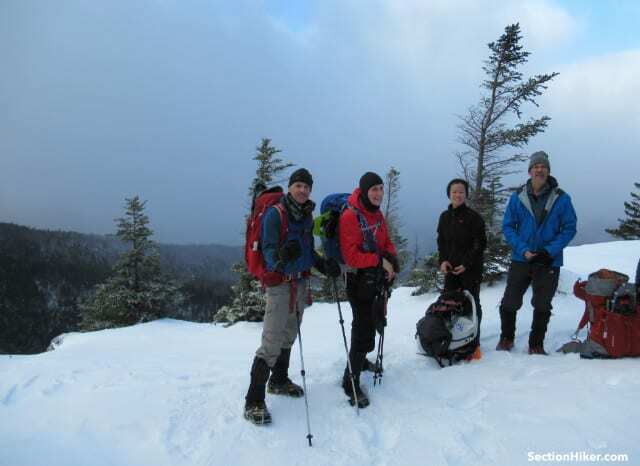 But this is the time to train for winter hiking in the Whites with traction aids and heavier packs, in preparation for the main event, which starts on December 22. 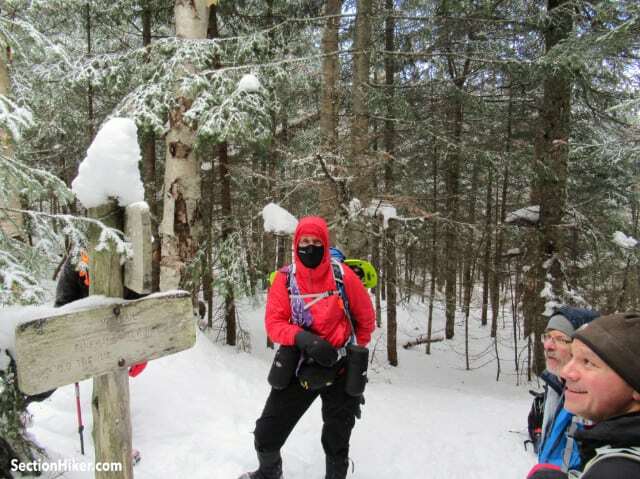 The post Climbing The Imp and North Carter Mountain in Winter Conditions appeared first on Section Hikers Backpacking Blog.